How does the senile old man still have a show? I give thanks for the ability to see and say and sing my thanks. This entry was posted on August 1, 2015, in druid, mansplaining, pagan, prayer, wicca and tagged druid, holiday, lughnassad, pagan, prayer, wicca. 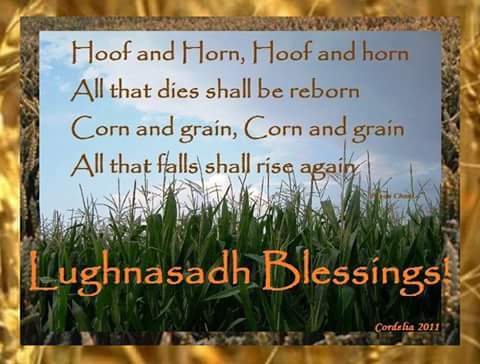 Lughnassad/Lammastide is the first thanksgiving in our calendar. It was the first of the harvests when people of the earth knew if the harvest yield would be enough to get them through the winter. Pagans celebrate it as our thanksgiving. Our coven has often had a barbeque and made bread together for our celebration. Anyone who knows me from my camp days knows I used to travel with my songbooks which grew to many volumes over the years, typewritten and hand written by me and covered in stickers appropriate to the song on the page. Thousands of songs, rounds and graces collected from camps, campouts wherever Girl Scouts and camp counselors get together and sing. My favourite types of songs have always been graces and rounds.